The Malta Council for the Voluntary Sector has today launched for the fifth consecutive year the National Volunteer Award. The National Award 2015 will once more be complimented by another three sub awards which are the Youth Volunteer Award, the Volunteer Organisation Award and the Corporate Volunteering Award. The National Volunteer Award shall be awarded to an individual volunteer who has contributed in any field, such as social, humanitarian, health, ecological, cultural, education, sports, etc. The voluntary work must have had a positive contribution towards a particular field and should ideally have served as an inspiration to others. 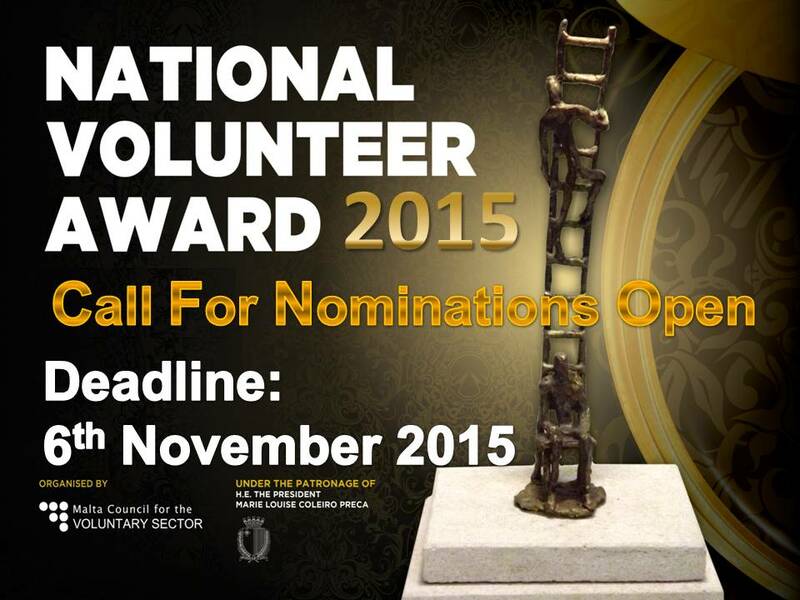 The Youth Volunteer Award is a new proposal which shall be awarded to a Volunteer between the age of 16 and 30 years. This award shall have the same aims as the National Volunteer Award and has the main scope to promote volunteering amongst young people. The Volunteer Organisation Award is also a new proposal and shall be awarded to a Voluntary Organisation who has been outstanding in the sector in which it operates, being both innovative in its approach and services within the community as well as in its way of recruiting and supporting volunteers. The last award shall be the Corporate Volunteering Award which shall be awarded to that Company or Organisation coming from the Private Sector which has given tangible support to the Voluntary Sector, both by direct support as well as by supporting and facilitating its employees to volunteer. 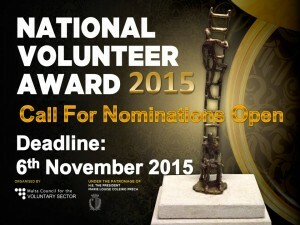 Nominations for the Award shall be received by the Executive Secretary MCVS on behalf of the Evaluation Board by the 6th November 2015. The nominations must be in hard copy and signed by at least two persons who have been closely associated with the nominee or the nominated organisation through work or other activities. Each nomination must clearly show briefly the work undertaken by the nominated person/entity to merit such an award. More details in relation to the award ceremony will be given at a later date.